Why do some investors choose to "go it alone"; to navigate the world of investing based on their own observations, information, or feelings? For the thrill or excitement? Maybe they share a belief that investing is easy, or that making their own investment decisions is more cost efficient? But for the go it alone investor, how have they fared? 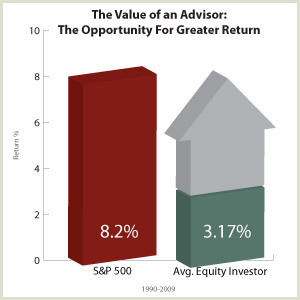 According to a study by Dalbar, Inc., over the period 1990 - 2009, the average equity investor received an average return that substantially lagged the return of the S&P 500. The tendency for investors to sell underperforming investments and then replace them with others that have performed well; a pattern of "buying high," and "selling low." Investment activity motivated by media hype, financial news networks, or televised "experts." While investment returns are unpredictable, a financial advisor may help you to avoid some of the common pitfalls of investing so you can stay focused on your investment objectives, and committed to your long-term plan. An experienced advisor will help you to define your goals, and help you in implementing a strategy designed to potentially increase your return over time. Staying abreast of economic and investment trends that may affect your portfolio and making changes as needed. Securities offered through Securities America, Inc. Member FINRA/SIPC. Insurance products offered through KCPAG Insurance Services LLC. Advisory services offered through KCPAG Financial Advisors LLC. Tax planning services offered through Kemper CPA Group. Kemper Capital Management LLC is the holding company for KCPAG Insurance Services LLC and KCPAG Financial Advisors LLC. Kemper Capital Management and its subsidiaries are not affiliated with Securities America. Our firm utilizes Symmetry Partners, LLC in the power of passive approach to portfolio construction. Symmetry Partners, LLC is an investment advisory firm registered with the Securities and Exchange Commission. Symmetry charges an investment management fee for its services. All Symmetry Partners’ fees can be found in the ADV Part II located on the Symmetry Partners’ website, www.symmetrypartners.com. Diversification seeks to reduce volatility by spreading your investment dollars into various asset classes to add balance to your portfolio. Using this methodology, however, does not guarantee a profit or protection from loss in a declining market. Different types of investments and/or investment strategies involve varying levels of risk, and there can be no assurance that any specific investment or investment strategy will either be suitable or profitable for your portfolio. You and your advisor should carefully consider your suitability depending on your situation. Symmetry follows a passive investment strategy that involves limited ongoing buying and selling actions. Passive investors will purchase investments with the intention of long-term appreciation and limited maintenance. Passively managed portfolios are designed to closely track their respective benchmark index rather than seek outperformance. As a result, the portfolio may hold securities regardless of the current or projected performance of a specific security or a particular industry or sector. Maintaining investments in securities regardless of market conditions or the performance of individual securities could cause the portfolio to lose value if the market as a whole fails. Equity benchmark performance and systematic equity investing examples are represented by the Standard & Poor’s 500 Composite Index, an unmanaged index of 500 common stocks generally considered representative of the U.S. stock market. Indexes do not take into account the fees and expenses associated with investing, and individuals cannot invest directly in any index. Past performance cannot guarantee of future results. Average stock investor performance results are based on a DALBAR study, "Quantitative Analysis of Investor Behavior (QAIB), 2010." DALBAR is an independent, Boston-based financial research firm. Using monthly fund data supplied by the Investment Company Institute, QAIB calculates investor returns as the change in assets after excluding sales, redemptions and exchanges. This method of calculation captures realized and unrealized capital gains, dividends, interest, trading costs, sales charges, fees, expenses and any other costs. After calculating investor returns in dollar terms, two percentages are calculated for the period examined: Total investor return rate and annualized investor return rate. Total return rate is determined by calculating the investor return dollars as a percentage of the net of the sales, redemptions, and exchanges for the period. Standard & Poor’s 500 Index represents the 500 leading U.S. companies, approximately 80% of the total U.S. market capitalization. Indices are unmanaged. Investors cannot directly invest in an index. Indexes have no fees. Historical performance results for indexes generally do not reflect the deduction of transaction and/or custodial charges or investment management fees, the incurrence of which have the effect of decreasing historical performance results. Actual performance for client accounts may differ materially from index portfolios.